Ryan Eggold as Dr. Max Goodwin in New Amsterdam. You probably thought that the existing Coldplay version of the Coldplay song "Fix You" — which, by the way, I love — was maudlin enough for any montage-accompaniment needs you could possibly have. This is because you have not seen NBC's New Amsterdam, which premieres Tuesday night. It's easy, in these times of experimentation and directorial flourishes, to neglect the arrival of fall broadcast pilots. Critics don't fuss over them, thinkpieces don't spring from them, and movie stars usually don't appear in them. But broadcast pilots can still be special and promising — more in recent years in comedy (The Good Place and Speechless, for instance) than in drama, but there's nothing to say we couldn't wake up this fall to a new Friday Night Lights or Scandal. Why not, I figured, see about this new doctor show? I liked ER, after all. I like Grey's Anatomy (off and on, like many people). Let's give it a chance! New Amsterdam is about an aging New York public hospital that's fallen on hard times, inspired by Dr. Eric Manheimer's memoir about working at Bellevue. While New Amsterdam (known to an EMT throwing out a clunky piece of alleged world-building as "the 'Dam") has some dedicated staff members who are trying to help, it also has a lot of lazyboneses who just don't care. They care more about billing than they do about patients! They are lazy! They need ... a hero. You will be shocked, I tell you, shocked, to learn that the show opens with Dr. Max Goodwin (see, his first name sounds like a fun dude and his last name has "Good" in it!) waking up to James Brown's "I Feel Good," which deserves so much better than the way television and film frequently use it to make dull people seem cool. Dr. Max jogs to the hospital, where he finds himself in a locker room where two nurses and a member of the janitorial staff are speaking Spanish and, of course, they are talking about what they've heard about the hospital's new medical director, offering exposition about they've heard how he ran a no-name clinic where he fired all the nurses but turned the clinic around. They bet he won't last, no sirree! If you predict this scene ends with them realizing this is the new medical director and he's understood everything they just said, and with Dr. Max expertly speaking Spanish to them and just crushing it smugness-wise, then congratulations: You were not born yesterday and have been exposed to television of this kind. There is so much going on in this first hour that it becomes comical: possible dangerous outbreaks, possible terrorism connections, immigration policy, bringing someone back from the dead, a debate about interracial dating, a pregnancy imperiled, a spunky younger doctor who takes a risk for a patient (and needs Dr. Max to tell her what to do next), and a wise Indian doctor (played by the very great Anupam Kher) who's maybe the only person besides Max who's allowed to be right about anything. Even if you are familiar with television's tendency to make shows about great white-dude geniuses who tell everybody else what's what and inspire the uninspired, the bluntness of the instrument at issue here might surprise you. Aside from that initial showing-up of the foolish Spanish-speaking people who underestimate him, Dr. Max also insults the doctor, played by Freema Agyeman of Doctor Who, whose job it is to manage the hospital's public image, eventually rerouting a car she's in without telling her because it officially is controlled by the hospital and he wants her to do what he wants and not what she wants. (Any woman can tell you that having the car you're in go somewhere you don't expect is definitely a lot of fun and would make you trust your new boss a lot!) He is tailed by Dora (Zabryna Guevara), who seems to be some sort of administrator, who mostly looks worried while he rebels and explains. Not for Dr. Max the limitations of the lesser boss who considers the dignity of the staff! No, he fires the whole cardiac surgery department (apparently mostly for effect), insults them as they're leaving, promises to hire 50 new doctors (apparently with money he's going to find in a hollow tree), and instantly promises that every reform requested by the head of the emergency department is "done," including having no waiting room, because patients will go directly to beds. Why didn't anybody else think of that? YOU CAN'T HAVE LONG WAITS IF THERE'S NO WAITING ROOM! Most of this is just dumb, a TV fantasy of a bland man who can come walking in and save everyone. 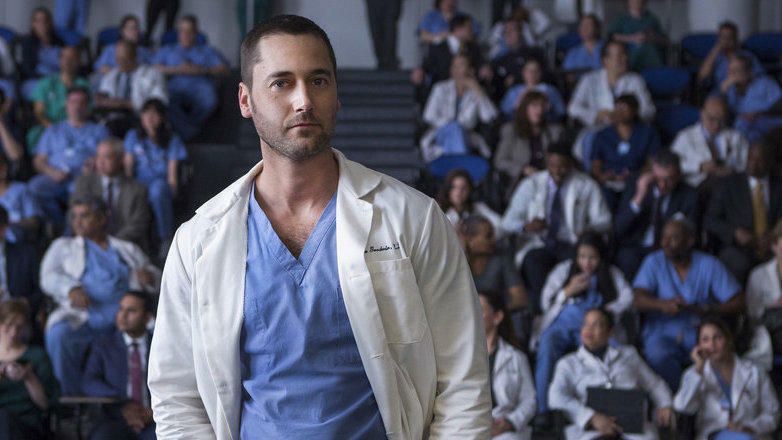 Ryan Eggold, who plays Dr. Max and was much better as a dangerous racist in BlacKkKlansman, is given the benefit of not one but two humanizing twists in the first episode in order to keep you from concluding, as I did in my notes on the pilot, that he is a jerk who "needs a kick in the [pants, specifically the front of the pants]." But with the multiple health care crises we're facing, what is the implication of focusing on a public hospital full of indifferent doctors who don't really care about their patients? Are public hospitals really crumbling because the right supposedly charismatic savior hasn't jogged into the locker room and given everybody a piece of his mind? Are the Spanish-speaking nurses really in need of a guy who will leave them speechless and embarrassed? Are the doctors who have devoted their careers to struggling medical facilities really so disposable that they deserve to be humiliated and figuratively frog-marched out of the room by somebody who hasn't even spoken to them? Of course it's a fantasy, but what kind of a fantasy is this? Whose fantasy is it? Because it plays as the fantasy of someone who lives far from facilities like this and believes that the answer to genuinely vexing social problems is the right hero — the same fantasy that has always driven Aaron Sorkin to write That One Public Servant or That One Journalist who will save us all. As Sorkin did with The Newsroom, show creator David Schulner cynically posits that everyone else at New Amsterdam (sorry, "The Dam") is twiddling their thumbs, waiting for one man to come to the rescue, for one man to inspire them to "break the rules and heal the system," as the show's promotion relentlessly insists. Critically, while the challenges that face New Amsterdam and its long history come from Manheimer's book on Bellevue, as do some plot specifics for Max, the idea of him as a sole rescuer does not. The idea that everyone else is indifferent or uninspired does not. In fact, Manheimer's book says, "How people die and how we participate in their deaths is as much about us as about them. Our own humanity is at stake. In a society that is increasingly mesmerized by efficiency, measurement by numbers and a bottom-line mentality that extols profit and wealth over any other human value, the risk is clear to everyone I work with." The book does not position him as someone who has to explain the world to people who work in a public hospital every day, as the show does with Max. The book talks about broken systems; it is the show that has reduced the story to a man with a wink who knows everything (except when he's gently humbled by one of the few elders whose wisdom he acknowledges). If only. If only the deepest problems of poverty and medicine and government and empathy were waiting for one dude to jog in listening to James Brown. If only you could fire the whole cardiac surgery department and never miss them, just to make a point to the rest of your staff. If only the cause of long waits were waiting rooms. If only terrorism investigations ended in warm smiles. If only one doctor could fix the terror of a patient who can't return home to die because she'll be arrested at the border.